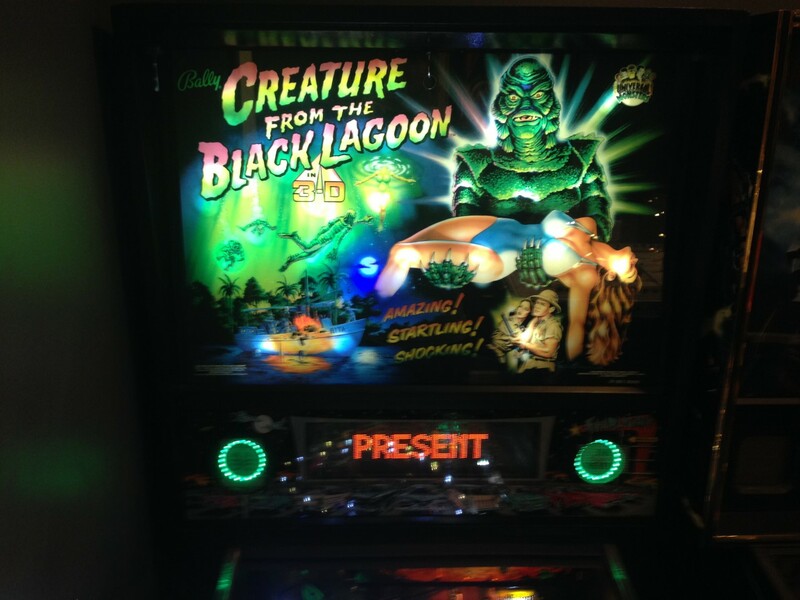 One of the best pinball machines from the 90’s was a pinball machine made after the famous movie, Creature from the Black Lagoon. Despite being a really old movie at that point, John Trudeau decided that it would be the perfect theme to do his drive in movie theater pinball theme. He was right, it turned out awesome. The hologram under the playfield though is the biggest feature by far. Basically if you play well enough the ‘creature’ will come alive under the playfield and actually move. The effect is pretty cool but you have to also play pretty well to see it. Most novices won’t ever see the creature. I owned a Creature from the Black Lagoon for about a year I believe. I really liked the game overall and kind of miss it. The music to me was one of the best parts, I like the 60’s songs it played along with the drive in movie theater theme. I think my wife’s favorite part was the snack bar, go figure, where you get popcorn and all the other food for the movie. If you’re looking for multiball, Creature is pretty limited in that regard. It features a 2 ball multiball for spelling ‘FILM’ and that’s it. In fact that’s the main point of the game, to spell ‘FILM’ by completing the different goals laid out on the playfield. The goals aren’t too hard, like spelling ‘KISS’, but since the game is somewhat difficult it can be hard for new players to actually spell ‘FILM’ to start. Once you’re played a bunch you’ll be able to get it pretty easily, sometimes multiple times per game. The ruleset for Creature is pretty simple, it’s basically a game that is meant for short ball times. If you’re able to get good enough on it to keep the ball in play for an extended period, it may start to get old after a while. Luckily that can be remedied by doing the standard pinball things to make the game harder. Creature from the Black Lagoon Pinball is a pretty expensive machine. Right now as of this writing (July 2008) it will probably cost you over $5000 to buy one. Is it worth that much? Well one thing is for certain, its price keeps rising so while $5000 sounds like a lot today, it might be $5500 or $6000 next year. If you really like that era of game, it’s definitely a great one to have. It’s great for guests as well. It’s biggest drawbacks are that technically from the sound/visual standpoint it has been passed by all the latest Sterns, and from a rules perspective it’s pretty simple compared to most modern games. That’s not necessarily a bad thing, as some modern games are too complicated, but it also means that it likely will get old faster than some other games. So where does Creature from the Black Lagoon pinball machine rank? According to Pinside rankings, it’s currently thought of as the 26th best game of all time. That’s probably about where I would put it too, it’s not in the top 10 but somewhere in that 20 to 50 range, depending on your preferences. I think if it had a slightly deeper ruleset or better quality sound it would probably be ranked closer to the top 10. I think all of them have pretty good merits. I think the Pinsound board and Color DMD would be the two I would go after. They’d add a lot to the game. Previous articleHow do you Master Overwatch?